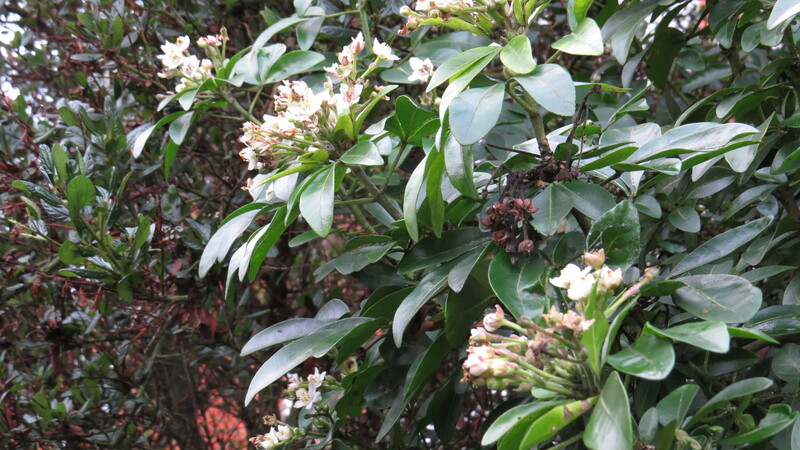 Dear Readers, in early January it is a delight to find any plant in flower, let alone one with a sweet smell and abundant waxy-white flowers. 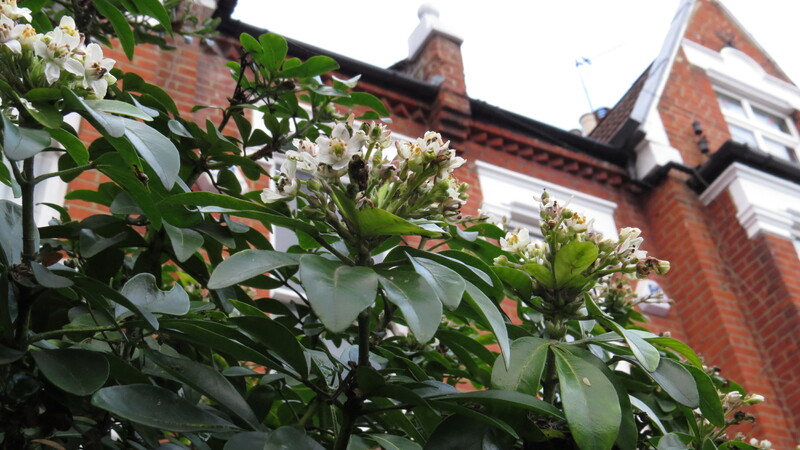 So, I was very pleased to find some Mexican Orange Blossom (Choisya ternata) in full bloom on Durham Road. 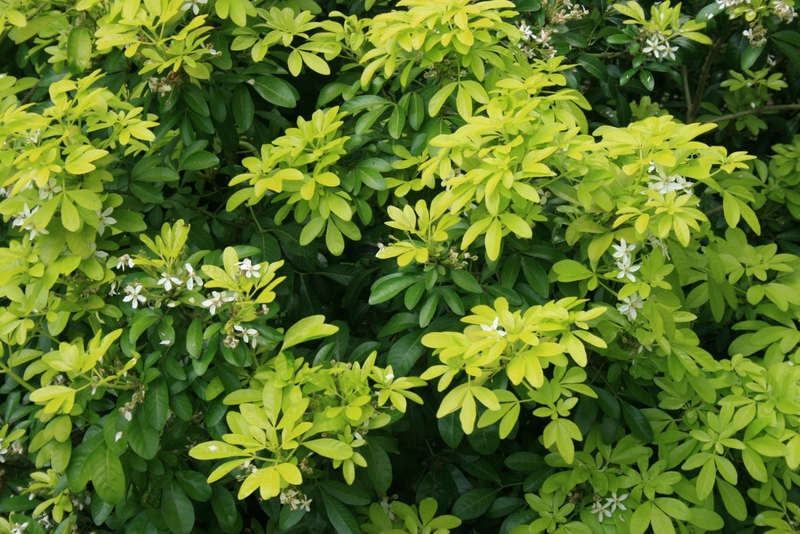 The plant should not be confused with Mock Orange (Philadelphus species): Choisya is a member of the Rue family, which includes all the citrus trees, Skimmia (a stalwart of any garden centre) and of course Rue itself, much used as a medicinal. What all of these plants have in common is an abundance of essential oils which can be used in everything from perfume to cookery to the aforementioned medicines. The homeware company Diptyque sells a candle scented with Choisya if you happen to have £42 going idle just after Christmas. It is described as ‘sparkling, bitter-sweet and appealing’. I do wonder if they sell any unappealing candles: maybe ‘Cabbage’ or ‘Trainers’ or ‘Slurry’ in case you want to give a present to someone that you don’t very much like. Although the flowers are sweetly fragrant, the essential oils in the leaves are described on the Horticulture Week website as having a ‘pungent, rather unpleasant smell’, so perhaps an ‘unappealing’ candle could be made from Choisya after all. 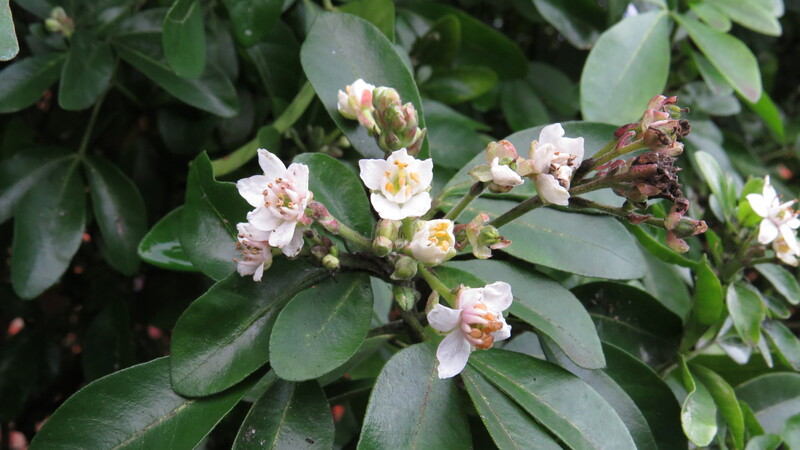 As the name suggests, Mexican Orange Blossom comes originally from the southern states of North America through to most of Mexico. The plant was ‘discovered’ by Alexander von Humboldt during his South American voyages, though I imagine it was already well-known to the indigenous peoples of the area. Humboldt named the plant Choisya after the Swiss botanist Jacques Choisy (1799 – 1859). He was a Swiss clergyman who contributed to the 17 volume ‘Prodromus Systematis Naturalis Regni Vegetabilis‘ , an attempt to record all the known seed plants in the world.The plant arrived in the UK in 1825 and was initially a plant of hothouses and orangeries. These days it seems perfectly happy outside, even in mid-winter. 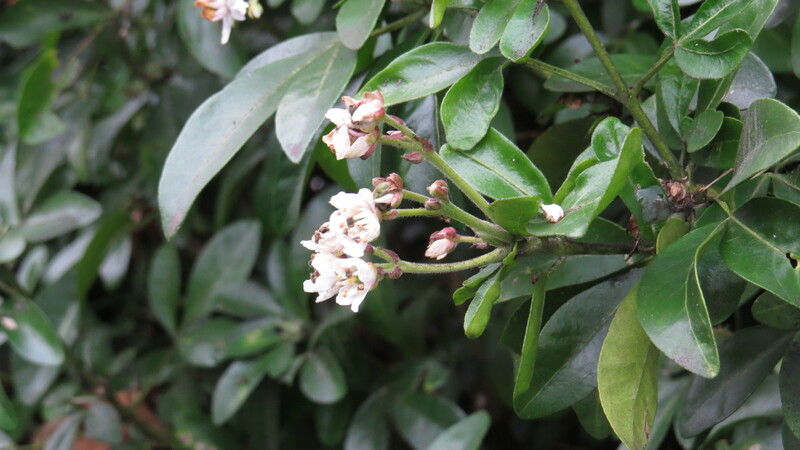 One puzzle about Mexican Orange Blossom is that it very seldom sets seed. 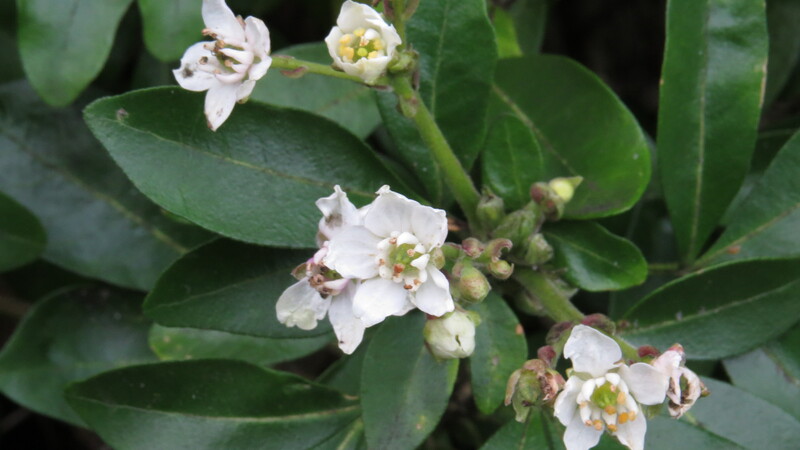 The plants encountered by Humboldt are now thought to have been cultivated examples – apparently truly wild Mexican Orange Blossom is very rarely encountered, and it might be that the plant is a hybrid. Certainly, the plants for sale in garden centres in the UK are grown from woody cuttings. What a puzzle! Apart from straightforward Choisya ternata, shown in my photographs, you can also find several varieties, though none of them apparently flower as enthusiastically as the original plant, and are less likely to give a second flush. Experiments have been made into the medicinal uses of the plant, which has been included in the Mexican Pharmocopeia for its anti-spasmodic and stimulant properties. In Mexican folk medicine, the plant is used to treat a condition called ‘nervios’, which seems close to the Western conditions of anxiety and depression. It has been investigated by scientists for possible anti-depressant and anti-inflammatory effects, and as a painkiller, and it seems that these studies have been promising. ‘Studies in Texan Folklore’ by Thomas Meade Harwell mentions that orange-blossom tea was thought to be good for heart ailments if taken before retiring in the evening. 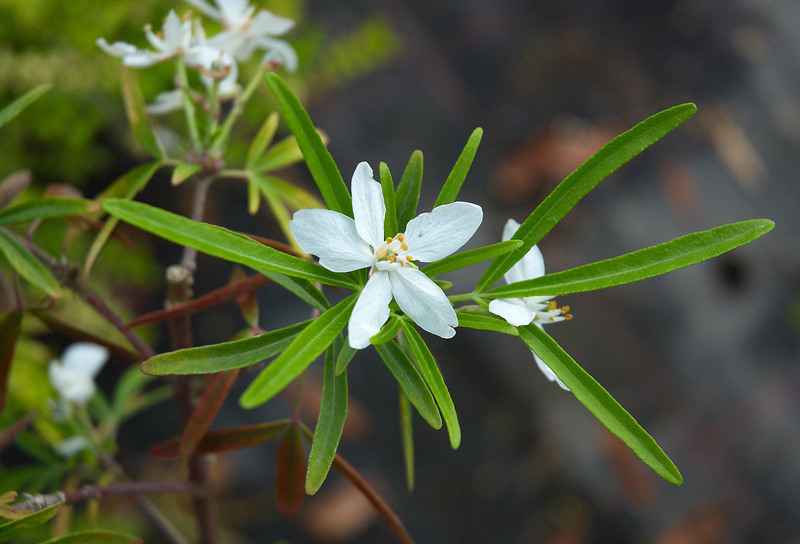 It seems that Choisya might, like so many plants, be a mini-medicine cabinet all on its own. I rather like Mexican Orange Blossom. Once established (as a youngster it is prone to slug and snail attacks) it provides a valuable and long-running source of nectar-rich flowers for pollinators, and a delightful scent when you brush past. The yellow-leaved varieties can give a pop of colour in the darkest of winter days. I do wonder sometimes if plants miss the warmer summers of their native countries at some cellular level, but the ones around here are doing very well. Seeing a plant with such an abundance of flowers at this time of year certainly put a spring into my step. All other blog content copyright Vivienne Palmer. Free to use and share non-commercially, but please attribute and link back to the blog, thank you! This entry was posted in London Plants on January 11, 2017 by Bug Woman. Your idea for alternative candle-scents is a winner. I smell (!) a business opportunity. Maybe ‘burnt cheese’ could be a winner too….